Ok, here's the InsaLev3 level pack for Keen 3, brought to you by Keeners. To play: take a fresh copy of Keen 3, extract and replace files, run "unlzexe keen3.exe" in DosBox command line, then run play.bat. You don't need to do the unlzexe part again if you play again later (in case someone hasn't done this before), simply run play.bat then. BTW, can you add a poll to this topic, so we can once again vote for our favourite level design?! Last edited by Nisaba on Fri Nov 16, 2018 10:22, edited 1 time in total. Oh man. A, B, C, D are super strong levels. Completed D first try! Hmm.. These are all really good. I think the pack has covered all the bases. Most of these levels are extremely fine-tuned. Keenrush please rename me to Roobar from the poll! Thanks! Oh wow, Gridlock even submitted a level. @KeenRush: I believe Roobar is 06-F.
As I thought, I started playing like I haven't played Keen ever. Also, I was surprised to see that the background went to black, which I didn't liked at all. I preferred it to stay blue. 00:01 - 01 - A - shikaddi - I didn't make it pass through that! I don't even know how to beat it, but I guess it needs a lot of fast movement and precision jumps. 15:09 - 02 - B - X-Rack Project - there are multiple ways. Some are hard, others are easier. Overall it's an enjoyable level. 26:37 - 03 - C - TheBigV - I didn't make it pass through that! OK this one is obvious what you need to do, but you must be really good at controlling keen. 34:02 - 04 - D - PandaKeen - the easiest of them all. Thank god there's at least one such. 35:25 - 05 - E - proYorp - OK enjoyable level. Not very easy, but not very hard. 40:35 - 06 - F - Roobar - that's my level. I forgot some parts and it wasn't as easy as I thought it would be when I tested it. 50:45 - 07 - G - Quillax - two very hard jumps; misleading pathway; was a though one, but I managed to make it pass through that level. 1:09:24 - 08 - H - Nisaba - there appears to be multiple pathways, but was too late to explore them when I realized that. 1:11:00 - 09 - I - 55Aavenue - clever usage of the shield at the beginning with a bit of exploration and some SGA texts. 1:19:46 - 10 - J - Troublesomekeen - up until that level, I didn't thought collecting muliple ankhs at once would increase the invincibility time accordingly. 1:24:17 - K - KeenRush: the guy who apparently don't know who I am despite me being in the forum for so many years.... OK I swear, I tried the hell out of that level and managed to almost beat it. But I didn't have the nerves to play more of it. There's just one very hard jump that I didn't liked, and when I surpass it, then there was the last part at the end which requires heck of a fast and precise reaction. It wouldn't be that bad if it wasn't the last part of that level. Still, fun level. 2:06:23 - 12 - L - Gridlock - got the same Castle theme like mine level, but it's completely different of course.Very clever way of managing to get inside the castle exit. Last edited by Roobar on Sun Nov 18, 2018 16:42, edited 1 time in total. I'm happy with the pack. As I was before and as I was hoping to be again, many times I was stunned by some of the ideas (and my stoopidity for not thinking of them). This is exactly why I hope my future modding is collaborative mods, people just think so differently. As for my level, I tried not to make it too difficult, but I also did not make it easy. I relished TheBigV's level for the challenge; it indeed requires good control of Keen and being fast about it. Probably my fav level. Another strong contender is Gridlock's level because it just has so many good ideas and the way it's played is so different from anything I expected to see. Overall, no level is bad. Thanks a lot, everyone! As for Insalevs, this one probably was the last I'm running. I won't be doing any for Galaxy. Something else, probably, one day, for Keen 1. Great level pack, lots of cool ideas, I liked all the levels (though there were a few I wasn't able to beat ). Difficult to choose a favourite but if I have to I'll say Gridlock's level because it was a cool design and I liked the aesthetics of it. I tried out the whole thing a couple days ago, and I can say that these are really nice levels! I managed to beat all of them, with the exception of TheBigV's level (which isn't a bad level, I just find it to be rather difficult for me). There's a lot of cool ideas presented in these levels, which I didn't really expect to see! I think they're all great, but I voted for Gridlock in the poll. I just like how it's designed in general; it seemed quite fitting as the final level. Looking at Roobar's playthrough of my level, I suppose there are some spots in my level that could've been toned down in difficultly, especially since it's supposed to be more of a puzzle level. I guess that's what happens when I get older and sometimes appreciate more of a challenge (I did manage to beat all of the levels in Extinction without cheating about a year ago, as far as I know). The levels in my upcoming mod, however though, should hopefully be much easier compared to my InsaLev3 level, with the exception of perhaps a few late-game levels. For the KeenWiki screenshot, I'm thinking that perhaps some time after the level pack's release, we can do a screenshot of the level that has the most votes in the poll. I think a week would be good (so that would be November 23). I like doing levels for the InsaLevs series, but I feel like the Galaxy games wouldn't work so well with the minimalism approach used with these level packs. If we do another community level pack, I think we should do something different; we could even do a different way of minimalism (screen-sized levels and using only one type of enemy per level come to mind). Also, I'd like to point out that this is the first time we had a modification of Keen 3, level pack or mod, since about four and a half years ago! Ok here's an idea: edit your existing insalevs, but you can use all tiles and sprites, so they can look more like a regular keen 3 levels. The idea of a single screen is also interesting, but I think should allow usage of more, if not all the tiles/sprites and you must be allowed to make from 1 to 3 levels. 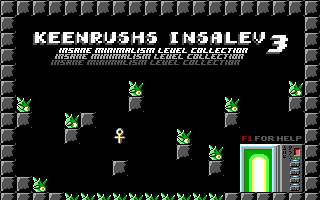 I didn't say that we would use the usual InsaLevs rules and then put it all in screen-sized levels, I just thought that we could make Keen levels that are like the usual ones except that it's all in one room. I do sometimes wonder, though, if one level per contributor isn't enough if they'll all be that small. Up to 2 or 3 might be better. The idea of taking one of our existing entries and then making it more like a typical Keen level does sound rather interesting, I'll say. If we do another community level pack, I think we should do something different; we could even do a different way of minimalism (screen-sized levels [...]). That's actually what I thought Insalevs was going to be the very first time I saw the topic, LOL. So, here’s my reviews on the levels! 01-A, shikaddi: Very challenging, with a bit of an air of mystery as I passed by the various ankhs, knowing I would need them later but couldn't get to them yet.... The hieroglyph-looking things and shape of the structures also add to this atmosphere. I do have to admit, I had a massive derp while playing this level. I completely missed the last bit, the part that comes after the cliff where you have to jump down. I did jump down once, and somehow convinced myself that just after that was where the level border was. It would've been a whole lot easier if I'd known about that part.... Totally my fault though. 02-B, X-Rack Project: Ah, the classic multiple paths/maze level. Always at least one of those in these contests so far, it seems. This one was quite fun. Not too hard to find the way to go, with a good length/difficulty ratio. 03-C, TheBigV: As far as hands-on Keening skill goes, definitely the hardest level. You have to be quick but precise. Because of this, I really appreciate that this level is so linear. It's pretty obvious which way you have to go, so there's no getting lost and confused, using up ankh time on a place you're not supposed to be. It's a good balance. 04-D, PandaKeen: I like that little "puzzle" at the start, with the player stuck between the fish-things and ankhs. Gives just a second of pause before realising the way out is obvious. The sense of direction is very good in this level, with the easiest paths being the most obvious. 06-F, Roobar: Really liking the architecture in this one. Very detailed. This castle's got all the bells and whistles. 07-G, Quillax: Interesting little puzzle here. I like it. Made me have to think outside the box about where to find the exit. That arrow hint was helpful though. 08-H, Nisaba: A neat idea, having different areas for difficulty variations. After the last Nisaba Insalevs entry, I'm definitely thankful for the option. 09-I, 55Aavenue: This one's a regular obstacle course. I really like the relay race part at the beginning. I actually had an idea similar to that bit for one of my first level ideas, but scrapped it 'cause I wasn't sure how to keep it interesting; which you've managed to do, 55Aavenue. 10-J, Troublesomekeen: This was pretty cool. It was definitely unexpected to see a remix of a Keen 1 level. Quite a fun little burst of peaceful familiarity to break up the difficulty of some of the other levels. 11-K, KeenRush: This one was intense. XD Good thing it's not insanely long. So trademark KeenRush precision-jumps level + timed segments = one heck of an adrenaline rush. I was actually out of breath by the time I won this level. 12-L, Gridlock: Definitely the most complex level here. Super creative way of using the Ankhs (I expected no less ). Really neat puzzle/challenge. Man, so many good levels here. It’s going to be tough to choose a favourite. By the way, this time I recorded videos of my first playthrough. I’ll be putting those up in a couple days. Im not done with this yet, but I think some levels I wont be able to beat... Im not Keen enough for this! I can see your frustration in many levels, but why do you have limited lives and fire enabled? You should have unlimited lives and fire disabled.